I had asked my daughter Genevieve, who lives in Darwin and works in surrounding Aboriginal communities, to take me to one of her favourite spots. She had heard of Jarrangbarnmi from friends and as it was a sacred site she thought it would be an ideal place to go to with her mum and sister Anna. I had always wanted to visit a sacred site as I am interested in Aboriginal culture and ways of relating to the environment. 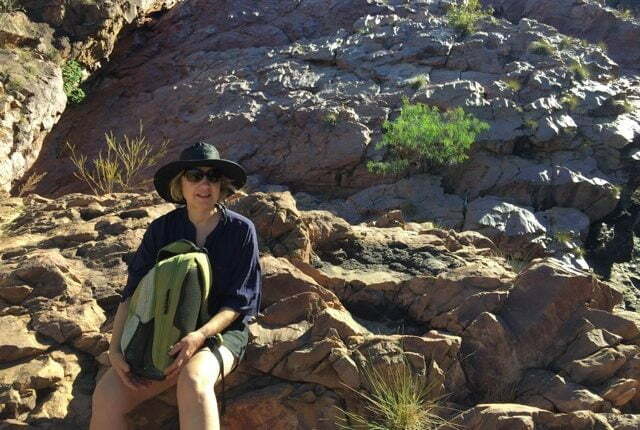 We had already been to the more popular areas of Kakadu on a previous trip. Kakadu is a timeless land, many millions of years old, and while this suggests it must be highly adaptable, it actually has a very delicate ecosystem with a narrow margin to allow for human interference. We could never re-engineer the finely tuned connection between climate, land and living things if we were ever to lose it. Jarrangbarnmi (Koolpin Gorge) in particular reflects this delicate balance. My two daughters and I left Darwin on a Friday afternoon in August, picking up our key from a key box at Mary River ranger’s station about three hours later. On our way home when returning the key, we stopped to read the large story boards describing the cultural and archaeological history of the area. 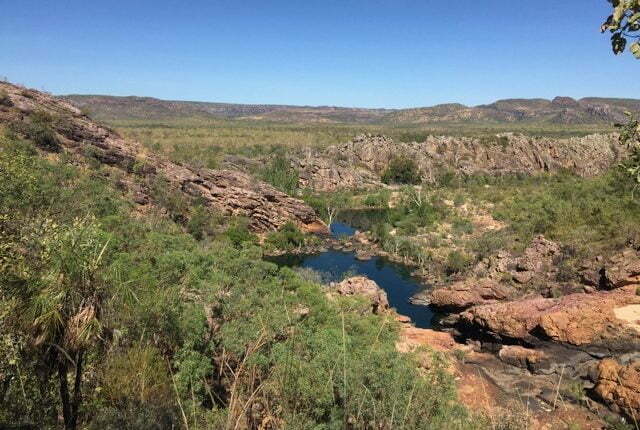 Jarrangbarnmi is a resticted access area in the south-eastern section of Kakadu National Park in Northern Territory, 324 kilometres from Darwin. The area can only be accessed in the dry season. Because Jarrangbarnmi is remote and culturally and environmentally significant, visitors must obtain a permit in advance (allow up to seven days for the permit to be processed). A high clearance 4WD is essential. There is no mobile reception (so go only if you are fit and well), no drinking water and strict visitor guidelines are in place. There is a campground with composting toilets and fire-places. I was confident travelling with my daughter as she travels to remote areas both for leisure and work and is a volunteer ambulance officer in remote areas. I would advise travellers only to do this trip if they have experience travelling through remote Australia or are with someone who has such experience. Although visiting Jarrangbarnmi requires an effort, visitors will be well rewarded. We headed into the bush along a rugged 4WD track. Being in the middle of the dry season the bush was very dry, however we did have two river crossings along the way. Many of the indigenous trees were losing their leaves, leading me to think we were in a type of ‘autumnal season’. Kakadu is a timeless land, many millions of years old, and while this suggests it might be highly adaptable to have survived, Jarrangbarnmi actually has a very delicate ecosystem with a narrow margin for human interference; we could never re-engineer the finely tuned connection between climate, land and living things were we ever to lose it. We arrived with just enough light to set up camp and cook dinner. The next day we read signs within the campground warning of local aboriginal lands that were out of bounds, of crocodiles in certain pools, and requests that visitors not apply sunscreen before swimming. Wide hats and protective clothing were a must as temperatures were reaching the low thirties. We packed up a picnic lunch, bathers, and enough water for the day, and headed into the gorge. There are a number of pools or waterholes within Jarrangbarnmi that can be accessed over rocks and by following the creek-bed as there are no marked walking tracks. 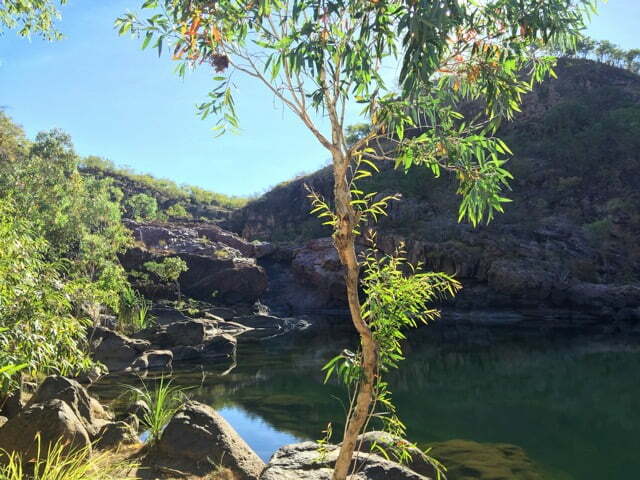 The first pool, Vegetation Pool, is inaccessible due to it being a sacred site—a residence of the Rainbow Serpent—and crocodiles are known to visit. There are another four pools further up the gorge: Pink Pool, Black Pool and then two more smaller pools. Some agility is required to climb rocks to reach all pools, particularly the further two. Visitors are encouraged to go only as far as they feel comfortable. The area was contained enough and it was easy to stick close to the pools and not get lost. We used the pools as our guide and spent a full day exploring in and around them. Small birds swooped at the water frequently, sipping quickly on contact before darting back to the safety of trees. Apart from small birds and insects and the sound of cockatoos, we neither saw nor heard other animal life. It was quiet and dark. The stars were beautiful and bright. I never felt threatened or afraid knowing that we were tucked away in a dark, remote place. It helped that we had each other for company. Knowing that we were on sacred land and that there was a community nearby, we had the respect to not wander into the bush. 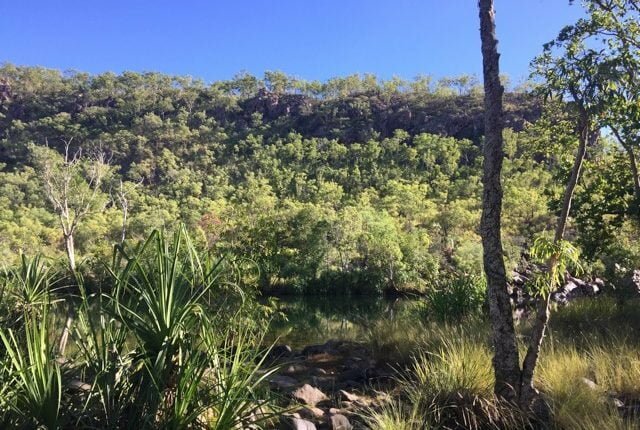 Most visitors who would be interested in visiting Jarrangbarnmi would have an interest in Aboriginal culture and the environment and would therefore understand respect for people and the land. And we did have a sense that we were on sacred Aboriginal land. When lying in the still shade, or feeling the coolness of the water on our warm skin, or listening to the soft buzz of the frantic beating of tiny wings, we sensed the sacredness around us, and we wanted to respect it and care for it. And we thanked the earth for its gift.